The Strange Story of Marie Lilly Bowers: Kidnapped and Found 14 Years Later in Genoa, Ohio. Marie Lilly Bowers shortly before she vanished. Genoa, Ohio is quiet village. Not much noise, and not much big news. So rarely does it ever make national or world news. It has happened, but not often. Once for the deadly tornado back in 1920, and another time for a sensational bank robbery nearly a century ago when the local druggist was shot to death. But perhaps the biggest local event that ever sent ripples beyond its village borders is one that few people today have ever heard of. It was a story so gripping that if it were to occur today, Genoa would likely have to endure a crush of TV crews and cameras all crowding each other to get the scoop. But there were no TV cameras back in the mid-1800’s, just newspapers and while they did report this story, its notoriety has faded along with the ink of the old news print. The roots of this curious tale began to unfold in 1867 in Sandusky, Ohio with the kidnapping of a young three-year old girl by the name of Marie Lilly Bowers. From family records it is written that on October 26, 1867, a neighbor asked Mrs. Martha Bowers if it would be okay of their three-year old daughter, Marie Lilly, could come to their house for a few hours to play. Her mother agreed and so Lilly left with the neighbor woman. She would never return. On her way home that afternoon, she vanished. An immediate search was conducted by her frantic family members to no avail, and by the next day, much of the city became involved in the search. It was recounted in family records that every “vault and cistern” was searched and even nearby “Sandusky Bay” was dragged for her body, but not a “single clue” turned up. Days went by and still no sign of Marie Lilly Bowers. Most of the major newspapers of the time carried the story of the missing child and the desperate search by her parents James and Martha Bower to find their precious “Lilly”. Many of the stories mention speculation that she had perhaps been abducted by a group of “gypsies” who were camped nearby. Days passed into weeks and then months. Lilly was gone. 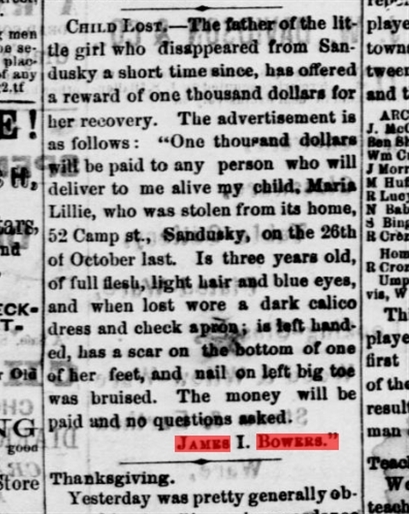 Mr. Bowers for years later would buy advertisements in papers around the country in a vain attempt to find his daughter. But to no avail. Some leads were reported and followed, but in the end, all proved to be false. The only clues came in rumors and theories. The Bowers family even contacted Levi Stanley, the “King of the Gypsies” living in Dayton, and asked that he become involved, thinking he might be able to find out if any of “his people” had the child. Stanley reportedly became angry with the suggestion, although a child was brought forward as a possible candidate for the missing Lilly, but after Mrs. Bowers saw the girl, she knew it wasn’t her daughter. The Bowers family, crushed and heart-broken, eventually left Sandusky, and moved back to the town of Hudson Michigan, north of Toledo, to a previous home where many of their children had been born. “ One day Mrs. Calkins hearing screams rushed into the hut and rescued Lilly from the stove where she had been placed by the other children because she had refused to do their bidding. 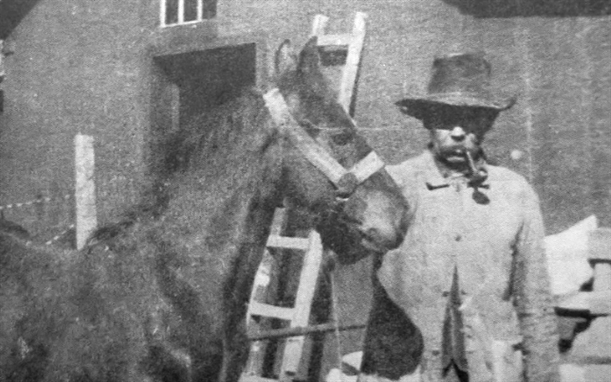 Soon after this, old Jack brought the child to Mrs. Calkins’ home. She was clothed in nothing but an old coffee-sac. The Calkins adopted the child. She was given the name “Ida Bell”. For the next 15 years, Ida Bell Calkins was raised as their own child, although, her new parents, James and Jennette Calkins always told her they were not her real parents and that perhaps someday she might find her real family, whoever and wherever they might be. In the years that followed, Ida Bell Calkins grew up in rural Genoa and lived with her new parents, and her five step brothers on their 80 acre farm near the current intersection of State Route 51 and State Rt. 163. Because she was so young, probably about three years old, when she was abducted, she had no recollection of her own family or her name. Because there were no local papers at the time in Genoa, the Calkins family never saw the numerous stories about the missing girl from Sandusky. By the time the young “Ida Bell” had grown to be a beautiful young woman of about 18 years, she had been schooled and raised to be a proper young church-going lady and traveled in “prominent circles” of friends. But Ida still wondered about her real identity and who her parents really were. Strangely she always favored the name Lilly and wished that it had been hers. She loved the name so much that she often gave her pets the name of Lilly. 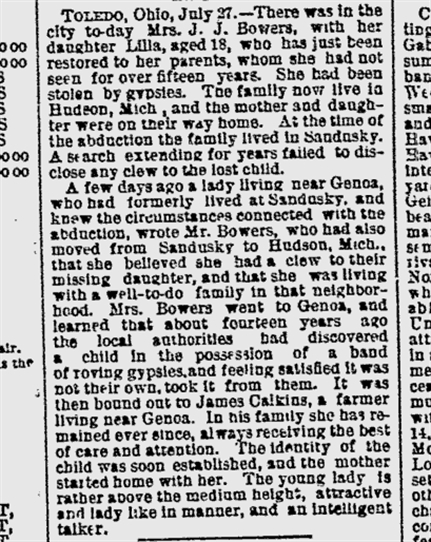 Then, seemingly out of the blue, Mrs. Bowers received word from friends in Sandusky that they had heard of a young woman in Genoa who might be the long lost Lilly. Quickly letters were exchanged with the Calkins’ family in Genoa and Mrs. Bowers soon made the trip south to Ohio to test another moment of truth. It was arranged that during a picnic at the old GAR hall in Genoa(which still exists), Mrs. Bower was to look at a group of girls and see if she could identify her daughter. When she saw “Ida Bell”, she is said to have immediately picked her out as her daughter Lilly. There was no reunion that day, however, for Mrs. Bowers was to visit the Calkins home the next day to reveal herself to the girl. When Mrs. Bowers was brought into the room with the girl..recognition was immediate. “My mother”, repeated Ida. These were the first words Mrs. Bowers had heard her daughter utter since she was a toddler. Further identification was verified by a birthmark on Lilly’s head and as Jeanette Calkins would later write,… “there was joy and weeping.” It was a miraculous mother and child reunion. After 14 long years, the misery and the mystery was over. Preparations were made at once for Marie Lilly Bowers to return to the family home in Hudson Michigan. Newspapers across the country began picking up the story and Genoa, Ohio was the place where this miracle story had taken place. Within weeks after the reunion, Ida Bell, or Marie Lilly, headed back to adopted hometown of Genoa and to marry a local man by the name of Daniel Cunningham. 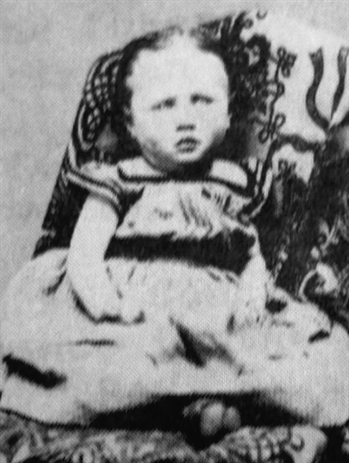 Curiously, within months, her biological baby sister, Edith Clara Bowers would also move from Hudson Michigan to Genoa to marry James Levi Calkins, Lilly’s stepbrother, with whom she had been raised. Both sisters remained in the vicinity until their deaths many years later. 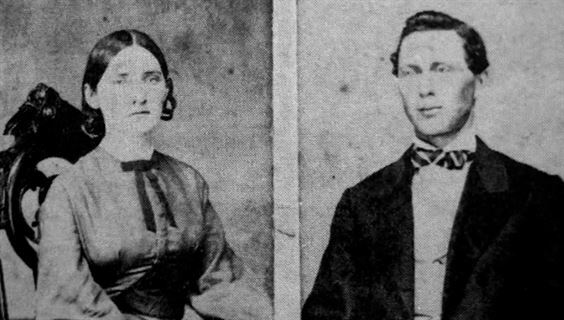 Lilly and Daniel eventually relocated to Gibsonburg where they raised two children, while her husband Daniel worked in the oilfields of Sandusky County. Lilly would later tell newspaper reporters that she felt very fortunate having two caring sets of parents. While she was very happy to have reunited with her real parents, the Bowers, she held the “highest and tenderest” regard for the James Calkins family of Genoa and could not ever think of moving away from them and deserting them in their old age. Marie Lilly “Ida Bell” Calkins-Cunningham lived in nearby Gibsonburg until she passed away at the early age of 45, in 1910 from a mastoid infection. 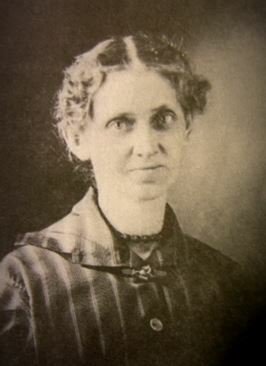 She is buried at Gibsonburg along with her two children and husband. Edith Clara Bowers Calkins, Lilly’s sister. The Calkins family legacy does not end with Lilly’s passing, for Lilly’s sister, Edith Clara, who married James Levi Calkins, lived to be nearly a hundred years of age and died in the 1960’s in the Genoa area. She was well-known and well liked by all who knew her. James Levi Calkins, Lilly’s stepbrother in Genoa who would end up being her brother-in-law. The Calkins family tree still stands tall in the Genoa area and still is growing. It now includes many well known local names such as Navarre, Early, Nagucki, Hesselbart, Schnapp and Bowland. My Thanks to Mr. and Mrs. Leo Schnapp of Elliston for helping to track down this fascinating story of Genoa’s past.